bioClarity Reviews - Good For Your Acne? bioClarity is 3-step vegan acne treatment specially formulated for teenagers and adults. The company is based in California and promises their products are plant-based and cruelty-free. 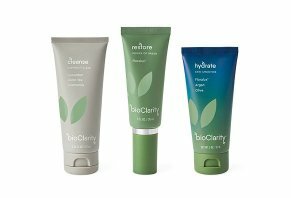 bioClarity is a plant-based cosmetic company that offers a 3-step facial protocol routine, suitable for all skin types. The company claims there are no fragrances or harsh chemicals in any of their products, and that they’ve been clinically proven to soothe skin and to help you achieve a clear, balanced complexion. The company also says that their products were created as an effective over-the-counter medication to treat mild to moderate inflammatory and non-inflammatory acne, which would include hormonal triggered blemishes, pimples, blackheads, and whiteheads. However, they emphasize it doesn’t work on cystic or nodular acne. Two ingredients they use to treat blemishes – which they claim to use instead of harsh chemicals – is Floralux and salicylic acid. They state that they use the highest concentration of salicylic acid in an over-the-counter formulation to clear up facial blemishes. Although bioClarity promises to be suitable for all skincare types, it seems their products are specifically targeting skin conditions such as acne, which is why we’ve done a bit of research into what acne is and what causes it. According to the American Academy of Dermatology, acne is most common skin condition in the United States. And although it’s a common condition for teenagers, women and now experiencing it from their 30’s all the way to their 50’s. Acne can develop almost everywhere in the body, but it is most commonly seen around the face, neck, back, chest, and shoulders. Most of the time the body pushes dead skin cells to the surface and disposes of it through the pores. However, acne occurs when a pore in the skin gets clogged up with dead skin cells. Our skin produces sebum (oil) to help naturally moisturize the skin and prevent it from drying out, and this is where acne forms. Sebum and dead skin cells begin to stick together and are trapped inside the pore. The result of trapped pores is what we see as blackheads, pimples, and whiteheads. From our research, there are a few factors that could be the cause of acne, and it is anything from puberty, hormones, food choices, dirt, and cosmetics. We’ve learned that acne is manageable through the use of topical applications. With several acne treatment products on the market, does bioClarity have what it takes to address this common skin condition? What clinical tests did they do to prove the efficacy of their ingredients especially when treating acne? What are the Main Ingredients in bioClarity’s Products? It’s no surprise that most people enjoy having clear, glowing skin and are in search of a product that can help them achieve just that. We thought we’d take the time to investigate a few of the ingredients that this company claims will give you gorgeous skin. We chose three ingredients from some steps of their skincare protocol which are reported to have the most clinical evidence showing they are effective in addressing acne. From what we know, the company uses a signature ingredient called Floralux. They’ve created it themselves by replacing the magnesium in chlorophyll and adding copper to it. Chlorophyll is a green pigment that is found in plants and algae and plays an essential role in keeping plants green and healthy. It also contains magnesium and antioxidants which Healthline reports can offer health benefits to the body and contribute to skin health. According to the National Institutes of Health, salicylic acid is a beta hydroxy acid and is obtained from the bark of the white willow and wintergreen leaves. It is often used as an anti-inflammatory and topical antibacterial due to its ability to shed a layer of dead skin when applied topically. Green tea extract is derived from the leaves of species of the evergreen shrub. It’s commonly used for tea but has also been used extensively in anti-aging products. Green tea contains polyphenols which have skin-soothing and antioxidant properties. Along with the three ingredients mentioned above, bioClarity also uses licorice root, chamomile extract, cucumber, and argan oil. Can bioClarity effectively treat acne, and is it safe to use? If we take a look at the above ingredients used in their products, there is sufficient evidence to support the reason they’ve included them in their skincare protocol, which we’ll touch on below in our review. Is bioClarity Safe to Use, and Do They Have Any Clinical Evidence to Support Their Claims? The manufacturer states that it is essential to consider any known allergies or sensitivities when using their product, but that allergic reactions are extremely unusual. They conducted an independent clinical study involving 30 participants over an 8-week period. After the evaluation was completed, the results showed positive results after two, three, and eight weeks of use. Overall, they said that bioClarity was well tolerated with only mild cases of occasional redness. On the company’s FAQ page, they mention that in their study a few acne cases appeared to worsen during the early weeks of treatment. They said this was due to the medication extracting blemishes underneath the skin, and they recommend that you continue to use the product until you see the bumps fade away. If you have very sensitive skin, we believe it is always important to do a patch test first, especially considering some of these products contain salicylic acid. Sites such as Medline Plus recommend you tell your doctor if you’ve become pregnant while using topical salicylic acid, or when you know that children and teenagers have had chicken pox, as they may develop Rey’s syndrome. Which Products Does bioClarity Skincare Offer & How Much Do They Cost? You have four facial products to choose from, and you have the option of buying them in singles, or in a monthly subscription kit. Cleanse 2.25 fl.oz = $9.95: A rich, foaming facial cleanser. It’s good for all skin types and helps to wash away dirt, oil, and environmental pollutants. Treat 1 fl. oz. = $ 14.94: This product is an exfoliating gel that clears the pores of dirt, oil, and bacteria with the use of salicylic acid. Restore 1 fl. oz. = $19.95 : bioClarity signature green gel with chlorophyll (Floralux). It can be used morning and night by itself or just before applying Hydrate moisturizer. Hydrate net wt. 2 oz = $19.95: A lightweight moisturizer which you can apply twice daily, as needed after cleansing, or after step three if using the bioClarity system. As we mentioned earlier, you can buy each of these products in singles, plus $3.99 for shipping, or you can choose one of their routine kits in a routine monthly subscription, plus free shipping. You can cancel your subscription at any time, and receive your money back guaranteed. They offer two routines which both cost $29.95, with a value of $49.95. The Clear Skin Routine includes: Cleanse, Treat, and Restore. With so many companies claiming they are “natural” and “earth-friendly,” can bioClarity live up to its claims of being a plant-based skincare company? Do not contain potentially toxic ingredients like parabens, phthalates, mineral oils, and synthetic fragrances. The Outer Peace line by Aveda targets acne. They have a foaming cleanser infused with plant extracts which can clean deep into the pores without irritation or over-drying. Their ingredients are cruelty-free, and people tested. Price: $29 for a 4.2 fl oz/125 ml bottle. The Acnedote line by Alba Botanica uses 100% vegetarian ingredients; it contains no harsh chemicals, parabens, or harsh sulfates. It uses 2% salicylic acid and willow bark extract. Prices range between $5 and $8, depending on product and retailer. You can find Acure products at Target. They’re 100 percent vegan, and the entire range is made for oily and acne-prone skin. They have a variety of products that are all paraben free and plant-based, which typically range in price between $5 and $17, depending on product and quantity. Each of these brands come with similar high marks to bioClarity, on their effectiveness to treat, and sooth acne skin. A few aspects they have in common is the use of quality ingredients, their cruelty-free and vegan/vegetarian practices, as well as the avoidance of harsh chemicals. In regards to cost, Acure, and Alba have certain products with similar prices to bioClarity, while Aveda seems to cost a little more. Given their close similarities, how can you choose which way to go? If you’re deciding to switch to a more natural and earth-friendly product, you’re probably wondering if this company indeed offers that. bioClarity has been featured on Cosmopolitan, Byrdie, Teen Vogue, and Health. The customer reviews from Amazon, bioClarity, Consumer Health Digest, and the Derm Review have all given it a 4.2 and above rating. A few reviews said that they saw immediate results after only a few days of using the 3-step program. One report mentioned using an acne treatment containing microbeads, which always hurt and irritated her face, but that bioClarity goes on smooth and has a nice lather. Another review said that it healed up the acne on her chin without leaving her skin dry, and flaky. The only cases that reported it not working were from those with cystic acne. Pulling all of this together, from our research, the company’s signature ingredient called Floralux, with its ability to promote healing in skin conditions such as acne, along with favorable consumer reviews on the 3-step protocol, suggests to us that bioClarity could be a suitable acne treatment. Write a Review for bioClarity!